So you’d like your family to have a healthy dinner, but you just got home from work, your fridge is empty and you don’t have money or energy for a sit-down restaurant where the kids are just going to wind up eating burgers and fries. What you really need is a quick, healthy stop that has a little bit of something for everyone. 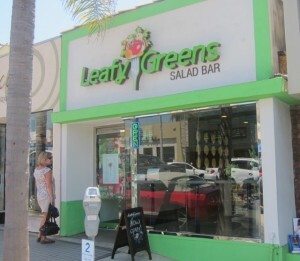 That’s the main premise of Leafy Greens, a new family-friendly salad bar in downtown Manhattan Beach. Weber and his wife Laura were frustrated with the lack of quick, healthy lunch or dinner options in the area. 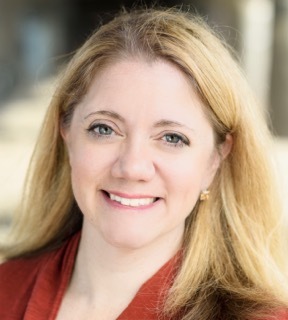 Laura came up with the concept and then spent three years developing a plan and working on logistics until finally opening the restaurant in August 2012. Leafy Greens offers what most of us can’t maintain in our own refrigerators – a complete selection of ready-to-eat fresh veggies every day. “The concept is, it’s almost impossible to keep this stuff fresh at home – or you end up getting sick of it,” says Weber. 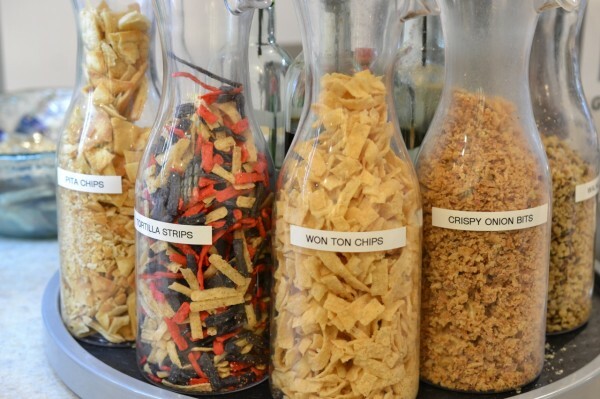 At the salad bar, you can also choose other more unique treats – black figs or Japanese udon noodles, for example – that you might not necessarily have on hand at home. Our big question: Will kids go for it? 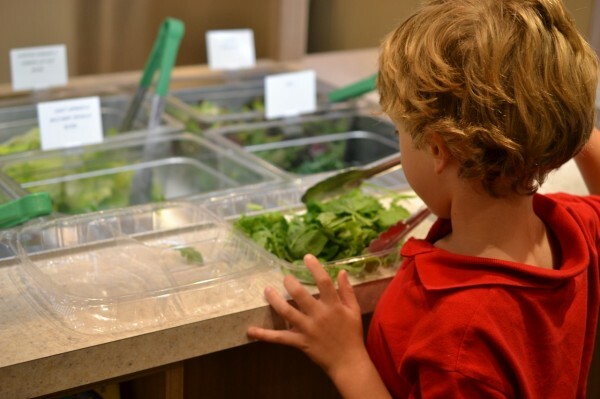 We kid-tested the salad bar with an admittedly small kid sample, but the response was surprisingly positive. Our young tester went straight for the kale in the leafy greens line, and then picked up pieces of waffle-cut carrot slices, bell peppers, baby corn, black beans, peperoncini, olives, grapes, cubes of cooked chicken, and slivers of tortilla strips. It’s fair to say that his meal was far more adventurous than something he would have picked out for himself (or found in the fridge) at home. Added bonus for kids: The counters are fairly low and accessible so most little ones can get a pretty good view of the array of choices. Weber notes that Leafy Greens offers local and organic ingredients whenever possible; the selections vary depending on season and availability. Most of the items are single ingredients but there are a few prepared salads. The avocado/tomato salad – a customer favorite – was a real standout. Also, there are no desserts for sale at the store, which is fine, because the salad bar itself was such a food adventure, our kid tester forgot to ask about dessert. Go figure. 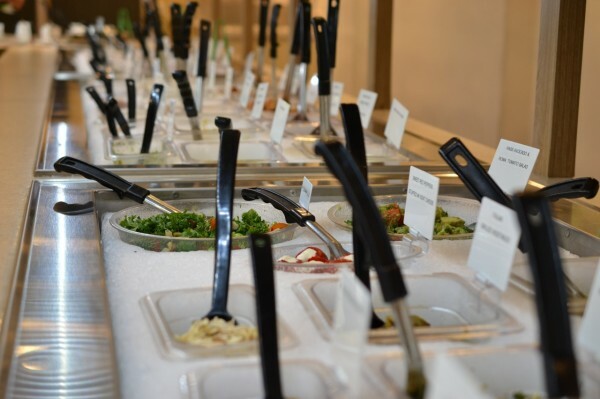 Leafy Greens Salad Bar, 308 Manhattan Beach Blvd., Manhattan Beach, CA 90266. 310-376-2502. Open from 11:00 am to 9:00 pm daily. Salads are sold by weight at $7.95/pound; soups start at $2.95. Seating available.